http://silkroadteas.com/tea_puerh.html Click here to link. Pu-erh teas are one of China’s best kept secrets. Widely consumed and a tea that has traveled with merchants and nomads for centuries, Pu-erhs are some of the oldest, most complex teas. 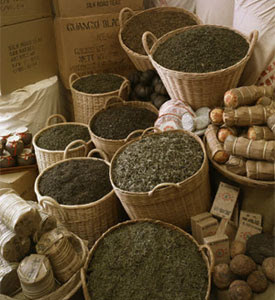 As Pu-erh teas age, they develop an increasingly earthy aroma and a sweeter full-bodied taste. They come in many, many forms – loose leaf, compressed and embossed by hand and machine into bricks and cakes of all sizes, aged in bamboo baskets and in stalks, fired and aged in citrus rinds and innumerable other shapes and materials all to create unusual tea.